We are currently inviting reader submissions of original writing, art or translation for the upcoming edition of the Arrow Newsletter, on the subject of "maternal/filial love, and the always and unsurpassable love of enlightenened beings." Arrow, vol. ii. a was published on Monday, March 31, 2014. This edition, which is dedicated to the theme of "Windhorse," recounts the developments at Saraha over the past months, current events and goings-on and upcoming events. Featuring submissions from readers on the "Windhorse" theme. Arrow is published quarterly. Click HERE to view online edition. 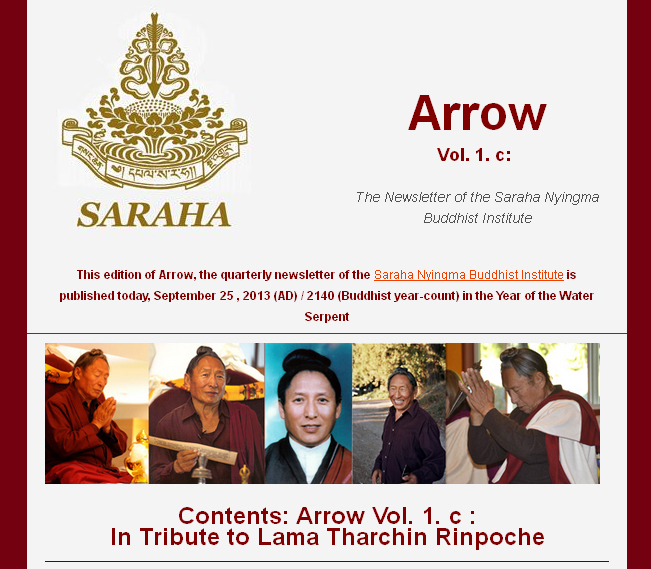 Or enter your name and email address in the form below to join Saraha's email list and receive future editions of Arrow.